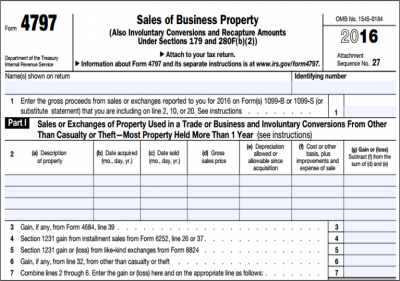 Form 4797 generally reports the sale of assets utilized in a trade or business as described in IRC §1231. Preparers should be aware that §1231 provisions are applicable to a wide range of parties, including but not limited to individuals, corporations, partnerships, trusts, estates, and LLCs. Form 4797 is a difficult form in that it provides for many errors. Practitioners must be diligent to secure the proper benefits of §1231. The Good: All trade or business property sales must first be combined to determine a net gain or loss for the tax year. If the result is a net gain, the taxpayer may be afforded capital gain treatment for gains in excess of recapture. On the other hand, net losses receive ordinary loss treatment. This is the best of both worlds. The alternative, ordinary gains (taxed at higher rates) and capital losses (subject to limitations) would both be generally less attractive. The Bad: Section 1231 has attached corollary rules for recapture of depreciation. Section 1245 requires all recognized gain to the extent of depreciation (including §179 expense) taken on personal property as ordinary income. This applies to the sale of depreciable personal property such as machinery, equipment, automobiles and furniture and fixtures. Section 1250 provides that upon disposition of real property at a gain, some of the gain may be taxed as ordinary income if accelerated depreciation has been used. The Ugly: In anticipating taxpayers’ manipulation of property sale dates across year-ends to separate losses (ordinary) in one year from §1231 gains (capital) in another year, a “Nonrecaptured Net §1231 Loss” rule was created. Reported on Line 8, this is commonly known as the “Five Year Lookback Rule.” In a year with a net §1231 gain, it will be recaptured as ordinary income to the extent of the aggregate unrecaptured net §1231 losses for the five most recent taxable years. Any remaining gain after the ordinary income recapture is §1231 gain. The five year lookback amount is not listed as a carryover item on Form 4797, and must be carried in the practitioner’s tax files. For the latest tips and tricks on tax form preparation, subscribe to the Surgent blog.